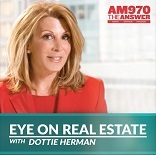 Join New York real estate attorney Jerry Feeney and CEO of Douglas Elliman Dottie Herman every Saturday from 10am – noon, when they host Eye on Real Estate on AM 970. Topics discussed include everything dealing with real estate and more. Here are a few examples: the need to do a detailed walk-through for a new home, the possible course of interest rates, the increasing popularity of vacation homes, the survival of the American dream of home ownership, mistakes people make regarding Social Security that can cost them money in retirement, problems with vacation timeshares, changes in the real estate market, how smoking can reduce your home’s value, good deals existing for homes on golf courses, making sure your dream home really has all the things you want, ways the government is making it easier to obtain home loans, lessons from our recession that apply to real estate, saving money on your children’s college education, unromantic financial questions which you still ought to ask your future spouse, etc. In this podcast, Jonathan Miller catches up with Jerry Feeney, an attorney who specializes in representing buyers and sellers in residential real estate transactions as well as institutional lenders in the New York City metro area. Jerry brings a wide range of experience to the table, including a stint with the SEC and working for law firms specializing in litigation and real estate, before establishing his own firm. Jerry also answers a legal terminology question that keeps Jonathan up at night.